Income inequality exists in an area where there is a mix of households that have very high incomes coexisting with a set of households with very low income. The high heterogeneity of income inequality among households typically extends to other demographic, social, economic and housing attributes. A neighborhood with high income inequality is unlikely to be homogeneous in most respects. This section reviews data and methods to examine/analyze income inequality at the block group level of geography. See more detail in related Web section. Block groups (BGs) average 1,200 population and cover the U.S. wall-to-wall. Using higher level geography, even census tracts, may tend to mask the existence of income equality. By using BGs, we are able to examine income inequality patterns for other geography such as cities, counties and school districts (by looking at BGs that intersect with these areas). The next map graphic illustrates how these patterns can be examined using GIS resources. The following view shows patterns of income inequality by block group within school districts in the Pelham, NY vicinity just north of New York City. K-12 public schools are shown as yellow markers. The Gini Index, based on ACS 2013, is used as the measure of income inequality. Colors/values of the Gini Index are shown in the legend as the left of the map. See more about the Gini Index below. The larger view shows BGs labeled with the Gini Index value. The following related view shows patterns of median household income (MHI) by census tract for the same area as above. This view shows the high median income for the census tracts in the southern section of Pelham school district. Compare patterns in the MHI by tract view with the Gini Index by BG view above. Tracts labeled with percent population 25 years and over who are high school graduates. Block group income measures are only available from the American Community Survey (ACS). Block groups are the smallest geographic level for which data are tabulated from the annually updated ACS. In the applications reviewed here, the ACS 2013 5-year estimates are used. Using the block group income inequality measures, enables us to examine characteristics in the vicinity of schools and how neighborhood inequality might exist across school districts. Neighborhods with high inequality might directly impact on K-12 student opportunities and educational outcomes. The Gini Index can be used as a measure of income concentration/inequality. 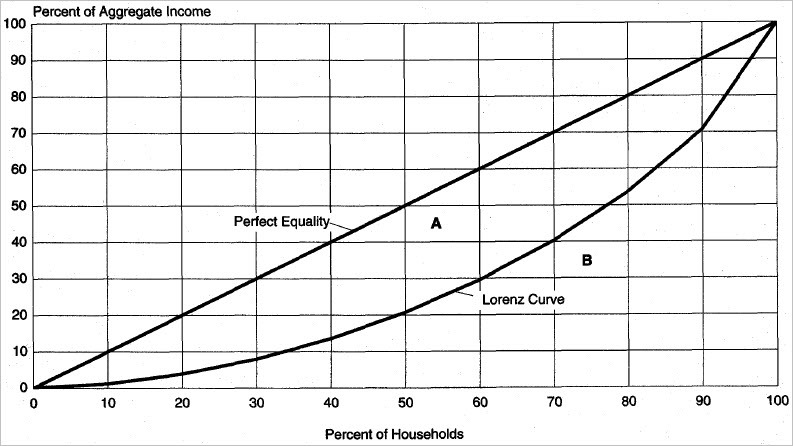 The Gini Index is based on the Lorenz curve The Gini Index varies from 0 to 1, with a value of 0 indicating perfect equality, where there is a proportional distribution of income across all households. A value of 1 indicates perfect inequality, where one household has all the income and all others have no income. In the graphic shown below, the Gini Index represents the area (A) between the diagonal, or line of perfect equality, and the Lorenz curve, as a percentage of the total area lying beneath the diagonal (A + B). When income inequality rises, the Lorenz curve bows further downward and the area (A) between it and the diagonal increases in size. The result is that the Gini Index increases. The Gini Index for the U.S. in the 2013 ACS (0.481) was significantly higher than in the 2012 ACS (0.476). This increase suggests that income inequality increased nationally. Examine state-by-state patterns of income inequality using the interactive table in this related section. The annually updated ACS 5-year estimates can tell us how income inequality is changing at the block group level. Appealing reasons for using the ACS data include the availability of related subject matter, such as educational attainment, that are relevant to extended analyses. Use the existing state K-12 schools GIS projects to examine income inequality based on block groups. Project datasets include a block group layer/shapefile that contains the Gini Index and several related income attributes. More about the state K-12 GIS projects. Since 1790, the decennial census has been arguably the single most important U.S. geographic-demographic-economic statistical data resource. Data from these decennial censuses are in daily widespread use for analysis and decision-making. The companion TIGER/Line digital map database is the underlying geographic database enabling most Web browser maps. The TIGER data helped spawn the development of Geographic Information Systems (GIS) and visual data analysis. This section illustrates use of the New York Times Chronicle tool to track language use relating to the decennial census. The Chronicle tool can be used to visualize language use in the New York Times news coverage throughout its history. 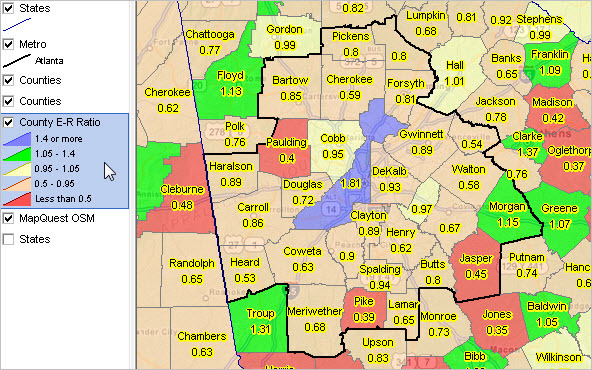 The following graphics show results of using the Chronicle tool. There are additional features of the tool not shown here, notably lists of accessible NYT stories. Click graphics for larger view. Exactly how the decennial census has been used in stories cannot be effectively determined using the Chronicle tool. The decennial census lead-up and process of conducting and tabulation data is the basis of many stories. The use of decennial census data is yet another basis for stories. The concept of the daytime population refers to the number of people who are present in an area during normal business hours, including workers. This is in contrast to the resident population present during the evening and nighttime hours. Information on the expansion or contraction experienced by different communities/areas between nighttime and daytime populations is important for many planning purposes, including those dealing with market size, trade/service areas, transportation, disaster, and relief operations. Using these data, we can determine if an area is a net importer, or net exporter, of labor … and to what degree. Examine counties and study areas of interest. This section provides access to estimates of the daytime population and related measures via interactive table and GIS project. These data are based on the 2013 American Community Survey 5-year estimates (ACS2013). See corresponding main Web section for more details. Download GIS project for use on your computer. See main Web section for more information. The E-R ratio is a measure of the total number of workers working in the area, relative to the total number of workers living in the area. The E-R ratio is used sn indicator of the jobs-workers balance in an area. A value greater than 1.00 shows there are more workers working in the area than living there. (net importers of labor). A value of less than 1.00 is shown in areas that send more workers to other areas than they receive (net exporters of labor). View, rank, compare the E-R ratio by state and county using the interactive table below. The following graphic shows a view of the interactive table. This view shows counties with total population 50,000 ranked in descending order on the E-R ratio. Note that the daytime population of New York County (Manhattan) is roughly double the resident population. See corresponding Web section for more details and data access/analysis tools. — Warren Glimpse is former senior Census Bureau statistician responsible for innovative data access and use operations. He is also the former associate director of the U.S. Office of Federal Statistical Policy and Standards for data access and use. By academic background an econometrician, he has more than 20 years of experience in the private sector developing data resources and tools for integration and analysis of geographic, demographic, economic and business data. The growth of income inequality has been widely reported. A recent New York Times story summarizes the wealth gap, a result of income inequality growth. The Pew Research Center report finds that in 2013, the wealth gap between upper-income and middle-income families was larger than at any point in the last 30 years for which we have data. Income inequality is a social issue and more. As the income inequality grows, market patterns and opportunities change and differ ways in different areas. Understanding the how, where and when of income inequality change is important for many reasons. See the related Web section for more data access and more options for analyzing income and income inequality. There are many ways to measure how income inequality is growing. This section uses data from the American Community Survey (ACS). Appealing reasons for using the ACS data include the availability of the same subject matter reviewed here for states is also available down to the census tract and block groupgeographic levels. The ACS data also provide many related subject matter items, such as educational attainment, that are relevant to extended analyses. Use the interactive table to view, rank, and compare national and state level median household income based on the 2012 ACS and 2013 ACS. Interactively examine how the Gini Index, a measure of income inequality, varies by state. These data are from the ACS 1-year estimates and compare respondent data for calendar year 2012 data with calendar year 2013. Estimates from the 2013 ACS compared to the 2012 ACS estimates show a significant increase in median household income at the national level and for many states. The following graphic view of the interactive table shows states ranked on the 2013 Gini Index (more about the Index below). Nine states have a Gini Index higher than the U.S. overall. 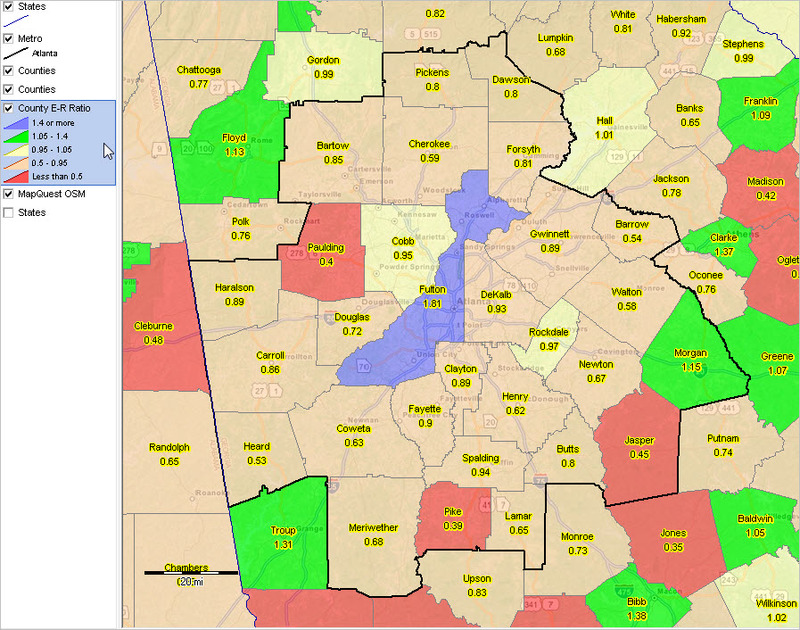 Use the MHI/Gini Index GIS project for further analysis and alternative map views; see details in Web section. The Gini Index for the U.S. in the 2013 ACS (0.481) was significantly higher than in the 2012 ACS (0.476). This increase suggests that income inequality increased nationally. 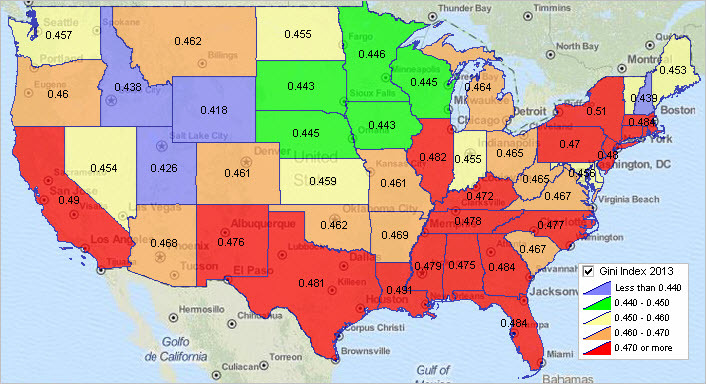 The Gini Index for the 2013 ACS increased in 15 states. Examine patterns of income inequality using the interactive table. In the near future, a new Web section and blog post will examine patterns of income and income inequality change on a national scope at the block group/census tract geographic levels. — Warren Glimpse is former senior Census Bureau statistician responsible for innovative data access and use operations. He is also the former associate director of the U.S. Office of Federal Statistical Policy and Standards for data access and use. He has more many years of experience in the private sector developing data resources and tools for integration and analysis of geographic, demographic, economic and business data. .. resources to analyze k-12 school characteristics and patterns … the U.S. national scope 2012-13 K-12 public schools dataset has just been updated (annual update). Wide-ranging characteristics of each school are now available for each of more than 102,000 schools. Use the interactive table on this Web page to view, rank, compare schools. Query for only those schools in a certain state or school district and then rank those schools on enrollment by grade, race/origin enrollment, free and reduced lunch fee participation, teachers and other subject matter. Use the resources described here to knit together multi-sourced data to gain insights into patterns and infrastructure for the geography, population and schools of interest. The following graphic shows schools in Mesa Unified, AZ (red markers) in context of median household income by census tract. The new school data are used in this application. More below about using this GIS project. Click graphic for larger view. The following graphic shows schools in Mesa Unified, AZ ranked on total enrollment and showing enrollment by grade. Use the interactive table to select a district (or state, county, ZIP) of interest and examine its schools. The new school data (all U.S.) may be accessed via this interactive table. Click graphic for larger view. The same school data accessible in the interactive table may also be used in corresponding GIS applications. The following graphic shows Mesa Unified (bold black boundary) in context of urban census blocks (orange fill pattern). Red Mountain High School (red box marker) is located at the pointer. The identify tool is used to display attributes of the school. Click graphic for larger view. Schools may also be categorized as urban/rural using the locale code. See “School by Locale Code” layer in legend at left of the map. Different markers are used to represent different locale codes. Locale codes are further described in the K-12 schools section. Install the no fee Schools & Schools District GIS Project on your computer to examine statewide to neighborhood to individual school/school district characteristics. See more about installing and using the GIS resources used to develop map views shown above. Add other data, create alternative views, change marker styles, label schools/areas in different ways. — Warren Glimpse, developer of the CV XE GIS software, is former senior Census Bureau statistician responsible for innovative data access and use operations. He is developer of the School District Special Tabulation under sponsorship of the U.S. Department of Education. He also works with wide-ranging schools, school districts and state education agencies. He has more than 20 years of experience in the private sector developing data resources and tools for integration and analysis of geographic, demographic, economic and business data. OpenStreetMaps (OSM) is a collaborative project to create/maintain a free editable map of the world. The OSM Internet-based map resource is built by a community of people who contribute and maintain data about roads, local geography and much more, all over the world. 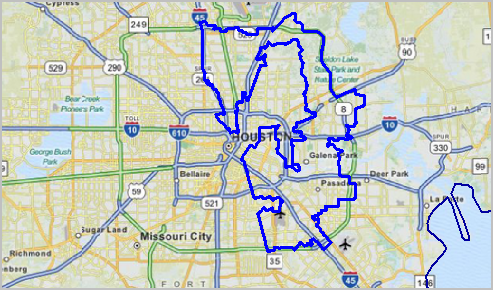 The following view illustrates using a congressional district shapefile (blue boundary) in combination with OSM as a base layer. This section illustrates viewing political/statistical geography in context of streets/roads shapefiles and/or Web-based street/ground coverage graphics. When using GIS tools to view census tracts (as one example) rendered through the use of shapefiles, there is often no convenient way to view the boundaries in context of roads/ground cover. There are two alternatives. One option is to add a layer using the corresponding streets/roads shapefile. 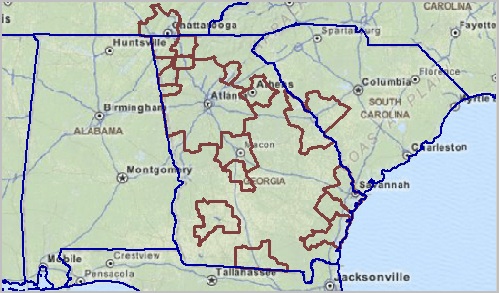 This option has important features but is often difficult, time-consuming or not feasible as the roads shapefile coverages are organized in county units. Also roads shapefiles provide only part of the picture with respect to ground coverage. 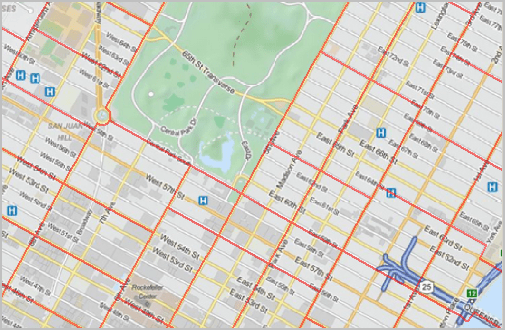 A second option is to use Web-based roads/ground coverage tiling services such as OpenStreetMap. Both options are reviewed here. Metropolitan areas are shown as brown boundaries in the following view. The CV XE GIS software is used to view a census tracts shapefile/layer in context with 1) roads shapefile/layer and 2) Web-based OpenStreetMap (OSM) layer via OSM WMS (OGC Web Map Service). CV XE GIS supports the OGC WMS standard, which means that it can be used to open map layers from any properly functioning WMS server, including OSM WMS servers. Use of the OSM shown here is available at no cost and has global coverage. Tiling graphics are courtesy of MapQuest. 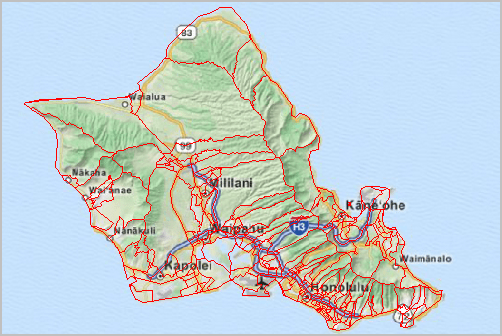 The Hawaii census tracts boundaries (red) are shown in the following view. No registration or fees are required to use the CV XE GIS software with OSM. Run the CV XE GIS installer on a Windows-based computer and create views/applications such as those shown below. Make custom maps of your neighborhood or a city/country anywhere in the world. New York census tracts boundaries (red) are shown in the following view. Census tracts are colored based on value of the diversity index. See color patterns assigned based on diversity index values as shown in legend at left of the map. Blue tracts are most diverse; red tracts are least diverse. Tracts shown with black cross-hatched pattern are tracts with 50-percent or more Hispanic population. Transparency of the shapefile layer is set to 80% enabling the view of the OSM basemap layer. New residential construction begins with building permits. Overall U.S. housing starts are approximately 2.5% less than permits issued (22.5% less for multi-family units). Completions are approximately 4% less than starts (7.5% less for multi-family units). During the past year-plus, “residential fixed investment” has been approximately $500 billion and remained steady at 3.1% of real Gross Domestic Product. Our focus here is on data and tools to analyze new authorized residential construction activity by metro — how might changing patterns affect you — in your metros of interest? Where are areas of highest growth by type of units in structure? What is the value of new construction; how is it trending in selected metros? See related Web section for more detail and interactive data access. This view shows the November 2014 total building permits per 1,000 housing units (2013 estimate) by Metropolitan Statistical Area (MSA). Building permit data (housing units authorized by building permits for new residential construction) are economic leading indicators. Investors and housing developers use these data to examine the characteristics and trends in new residential housing development. Finance and real estate professional and researchers examine building permit patterns to develop strategic insights. Government and policy makers use these data to get a pulse on markets and changing patterns to administer programs and operations. Important strengths of building permits data include very recent/current data. There is a very short time lag between the data accessibility and the reference date (November building permit data are available in December). Geographic coverage and granularity are also strengths with national scope coverage by state, metro, county and city. Seemore about these data below in this section. Monthly building permits data are part of the Situation & Outlook (S&O) database and information system. Access/analyze these data in context of related geographic, demographic, economic and business data. This section provides no fee access to these data via interactive table, downloadable data and GIS project. Find upcoming release dates using the Calendar and related Find Event tool. Use the interactive table to view, query, rank, compare building permit data by metropolitan area. Data are provided in the interactive table by month for January 2014 forward. Earlier data are not available for the current vintage metropolitan areas. The following graphic illustrates use of the table. The Year/Month May 2014 is selected. Metros are then ranked in descending order on Total Units. The Houston metro (blue highlighted) had the largest number of new authorized units (5,081) among all MSAs in May 2014. Select other measures of interest to rank/compare metros. Use the U.S. by Metropolitan Area New Authorized Residential Construction GIS project to create thematic pattern views similar to the one shown above. Zoom-in to any metro/region. Add your own data; change colors, labeling, subject matter used for pattern analysis. See details in this related Web section. Building permit data are updated monthly and are a part of the S&O MetroDynamics Database and Information System. View the MetroDynamics Metro Profiles that show building permits data contextually with other geographic, demographic, economic and business data. Click a metro link in column 2 of the metro interactive table to view a Metro Profile for a metro of interest. The building permits section is populated only for Metropolitan Statistical Areas. Examples: Houston … Los Angeles … San Francisco … Atlanta. See additional information about these data and their use.